The Porsche 911 R is pretty much perfect, except for the insane transaction prices that keep it in exclusively super wealthy hands. The only real flaw is a limited color palate and someone took the liberty of deviating from the factory offerings and it’s up for sale. 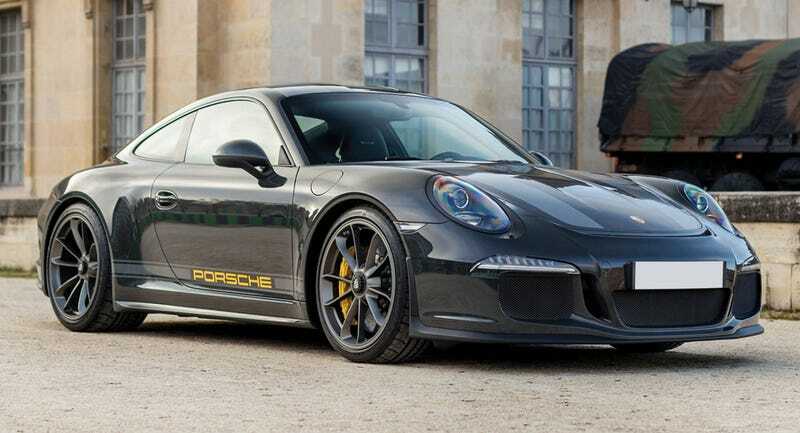 According to RM Sotheby’s auctions, one customer in France decided to paint his car in Slate Grey with contrasting silver stripes and yellow lettering as a tribute to Steve McQueen.The customer even insisted on getting car number 967 out of the 991 units to celebrate the original 911 R built for racing in 1967. While I’m not quite seeing the color connection to McQueen’s iconic 911, there is no doubt that this car looks amazing. It even comes with a personalized interior with McQueen’s famous quote, ‘Racing is life. Anything that happens before or after is just waiting’ stamped on the illuminated door sills. You can look at RM Sotheby’s auction listing to determine for yourself whether or not this is tacky. Currently, there is no projected auction estimate for this unique 911 R, but it’s probably safe to say that the final price will be well beyond what we mortals can afford. Whoever buys it will not only be getting the greatest current production 911, they will also be contributing to a worthy cause. ....25% of the car’s hammer price above its reserve (with a minimum of €25.000) will be given towards research for curing cancer in children, financed by the Gustave Roussy foundation. Located in Villejuif, just south of Paris, the Institut Gustave Roussy is one of the world’s leading cancer research institutes investing in cutting-edge technology and medicine, with the aim of making major advancements in the fight against cancer. So I may have jumped the gun a little with my letter to Santa for that 1991 NSX, and I know full well that this Porsche is not going to show up in my driveway this Sunday. So my gift to all of you is to wish you a Happy Holidays and some Porsche pictures to drool over!